The Big One for One Drop tournament was a booming success at the 2012 World Series of Poker, stealing the show at the biggest tournament series in the game over the past week. The three-day event was capped-off with a fantastic final table that featured poker superstars Phil Hellmuth, Antonio Esfandiari, Brian Rast and Sam Trickett, along with representatives of the business world in Guy Laliberte, Richard Yong, David Einhorn, and Bobby Baldwin. 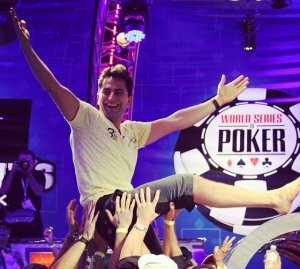 When the smoke cleared, and the final card was dealt, it was Antonio Esfandiari who would triumph, collecting the $18.3 million first-place prize –who looked to nearly faint after the realization set in. With everything the poker world has been through over the past year-plus, Antonio’s win was the perfect finish to a three-day sabbatical for poker players and fans that was the Big One for One Drop –helping us forget, if only temporarily, about Black Friday, Full Tilt Poker, the Epic Poker League, and all of the other events that have left a cloud over the poker world. The first player eliminated at the final table was Richard Yong, who got his last chips into the middle against Brian Rast with a slight edge, holding A/2 to Rast’s K/J. Yong dodged a King and Jack for four cards, but the river did him in when a King hit. Yong collected $1,237,333 for his 8th place finish. Next out was Bobby Baldwin, who thought he was eliminated earlier at the final table, not realizing that he had four-outs to an inside straight on the river to stay alive (which he then hit) against Guy Laliberte. Laliberte would exact his revenge on the 1978 WSOP Champion turned Las Vegas mogul, when his Pocket Jacks held-up against Baldwin’s A/T. Baldwin finished in 7th place, collecting $1,408,000. Brian Rast was the next player to hit the rail and did so in perhaps the most heart-wrenching way imaginable. Rast flopped the nut flush against Sam Trickett and was trapping the UK superstar, just calling the whole way. Unfortunately for Rast, Trickett was a lot stronger than he gave him credit for, having flopped a set of 3’s, and when the board paired on the river Trickett found himself holding quads, and Rast had no choice but to call the all-in river bet with his flush. Rast pocketed $1,621,333 for his 6th place showing. One Drop organizer Guy Laliberte was the 5th place finisher when he found himself in the classic race situation, holding Pocket Queens against the A/K of Antonio Esfandiari. Antonio would hit a King on the turn to win the hand (and secure a huge chip advantage) and eliminate Guy, who played marvelously throughout the event. In the end he would walk away from the tournament with $1,834,666 to show for his efforts (which is probably all going to the One Drop charity). Phil Hellmuth managed to take a short-stack, and a card-dead final table, all the way to a 4th place finish, and nearly had a chance to double-up and be a factor in the tournament. Hellmuth got it in bad against Trickett, holding A/T to the Brit’s Ah/Qh, but went ahead on an Ax-Th-5h flop, giving Hellmuth two-pair and Trickett top-pair and a flush-draw. Trickett would pair neither his Queen nor make his flush, instead it was running straight cards that would end Hellmuth’s tournament in 4th place, worth $2,645,333. Three-handed play saw the short-stacked David Einhorn continually push all-in until Antonio called him in a dominating position holding K/T to Einhorn’s K/9. Einhorn hit the rail in 3rd place, an impressive feat for the hedge fund manager, earning $4,352,000 which is all headed to the City Year charity. Heads-up play between Sam Trickett and Antonio Esfandiari didn’t last very long as the two found themselves in a post-flop raising war with Trickett holding a flush-draw, while Antonio had flopped trips. Antonio dodged Trickett’s draw, winning the Big One for One Drop tournament, and stamping his name in the poker history books. Trickett will have to be content to console himself with the more than $10 million he will take home for his second-place finish (Trickett reportedly had a whopping 50% of himself, meaning he probably will take home more than Antonio after the backers are paid). This entry was posted on Wednesday, July 4th, 2012 at 9:05 am and is filed under Poker News. You can follow any responses to this entry through the RSS 2.0 feed. You can leave a response, or trackback from your own site.